The success of great websites and print projects are often determined by subtle choices in the colour palette. Your design is vastly improved – or ruined – by simple adjustments in colour palettes and here are some inspirational resources to get you started. Even before you add content, your design can begin to feel warm, bright, menacing, corporate, or ice cold – just by using a careful selection of colours. Below are a few selections that will help you on your way to becoming a master of colour! By utilising any of these you can create palettes and hex combinations of your own in no time at all. Not everyone will find each one useful, each one is very different, but try them all to find which one you are most comfortable with. Adobe’s industry standard for generating colour combinations. A plethora of creative and export options available, plus the ability to generate palettes from a picture upload and a very nice UI to boot. This resource is good if you’re after quick colour inspiration. Generated randomly on your space bar, you have the ability to ‘lock’ colours down and continue the generator to incorporate them. There is also an app for iOS and Android, as well as a native Photoshop or Illustrator add-on. Very similar palette generator to Adobe’s own with quite an in-depth breakdown of each colour, and a visual simulation that even includes showing the effect on colour blindness. Export options are aplenty too. This palette maker has no limit on the number of colours you can choose, and each one has it’s own hex code and RGB values. Moving the mouse around the area changes colour depending on up/down and left/right movements, scroll to saturate/desaturate, simply click to save a colour to a palette that stacks to the left of the screen. Colrd is a mix of palette creation, inspiration, and artwork search. 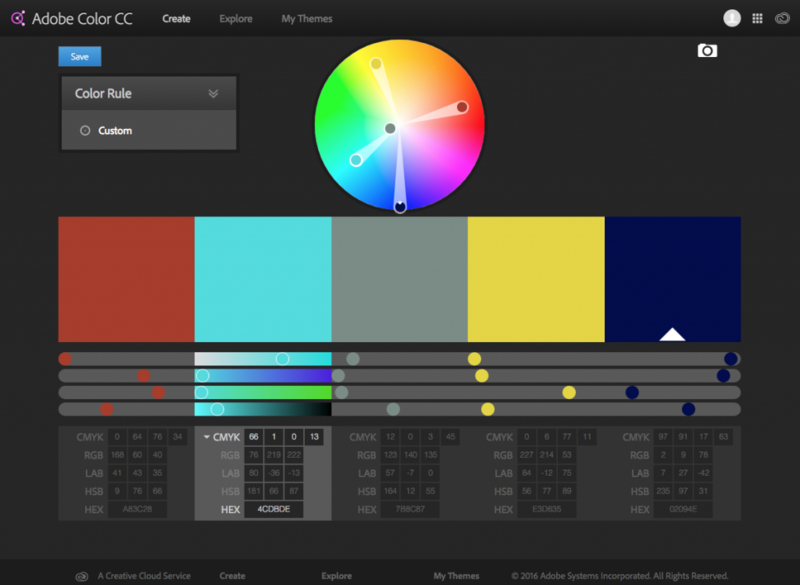 Users create colour palettes both from scratch and from artwork they post on the site. Not necessarily a colour palette generator, but this user-uploaded site is a cool way of finding artwork from their database based upon your selection of (up to) 5 five colours. Again, this isn’t a palette generator but does inspire by colour. A sliding RGB scale generates a search result of database images based on your chosen colour on the slider. You can also enter a specific search command to further filter by colour and search term. This Shutterstock colour utility is a step up from Spectrum because you can search in the same way, but you can add up to five colours into the mix. Great for inspiration. You don’t have to have an account to search but you will need one if you want to create lightboxes and download images.